The mophie workbook is a ‘protective smartcase’ for the iPad 2. Made by mophie – who I’ve known best for their excellent line of Juice Pack Air rechargeable battery cases for the iPhone. Although my favorite ‘outfit’ for the iPad 2 is the Apple smart cover and a slim skin on the back, I also like to have at least a couple of good options around for a full-protection case for my iPad 2. This mophie case seemed a good candidate for the full-protection case role, and I’ve been trying one out for the past several weeks. 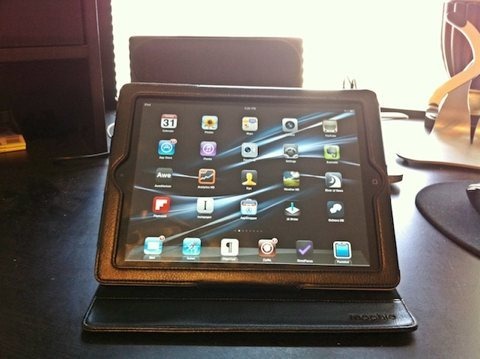 The mophie workbook for iPad 2 is priced at $49.95 – a mid-range sort of price for this type of iPad 2 case. It’s made of a ‘faux leather’ material that is said to be easy to clean and durable to the elements. It currently comes in black and white, with chocolate and purple versions coming soon. The workbook comes with four elastic strips in black, cyan, yellow, and pink. These attach to little sleeves at the top and bottom of the iPad 2 to keep it more secure inside the case. — The faux leather looks and feels quite good. It’s not luxurious leather like on a Vaja case, but it is also considerably less expensive – and it looks plenty handsome and professional. 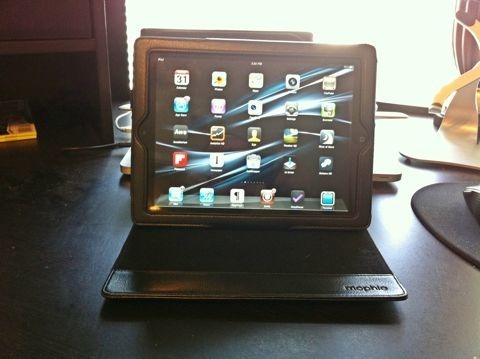 — The iPad 2 fits very well within the case, even with a Zagg leatherskin on the back of it. 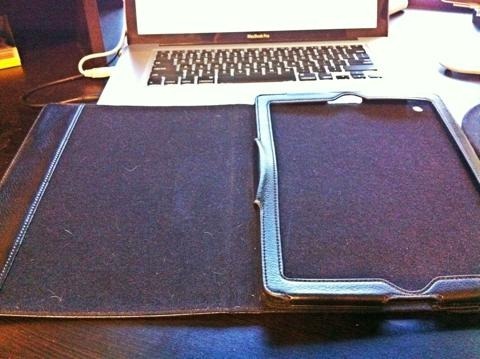 — It’s very easy to get the iPad 2 into the case, and to remove it quickly. There are some folio cases that make this difficult – so I always love seeing a case that’s makes inserting and removing the iPad easy. 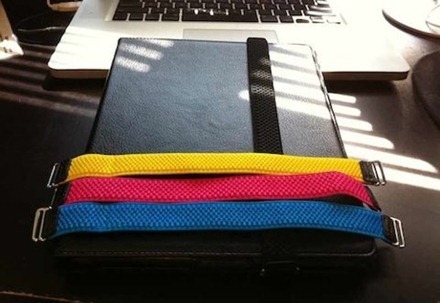 — The workbook uses a Velcro flap that holds the iPad 2 securely in place. This is easy to use and works very well. — The Velcro receiving area on the inside cover of the case is put to great use when using the case as a stand. It allows you to position the iPad 2 in a good range of positions optimal for viewing and typing. — The cutouts for the iPad 2’s ports and buttons are mostly well done. — The case supports the iPad 2’s automatic sleep/wake functionality – so the iPad 2 goes to sleep each time you close the case cover and wakes back up when you open it. — It has a nice, lightweight feel for a folio case, so it’s quite comfortable when you’re out and about using this case. — It’s also comfortable to use the iPad 2 while it’s in the case – it folds back nicely and makes a nice position for leaning on your lap and similar. — The biggest drawback with this case is that the Velcro area on the inside cover, which works so well for using the case as a stand, also ends up being a sort of magnet for pet hair and dust and similar. It really accumulates debris quickly and of course then passes some of it on to the iPad screen. 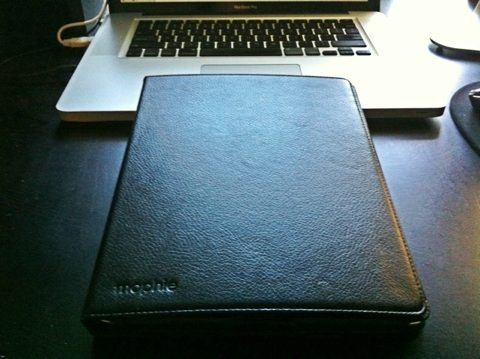 The mophie workbook is an excellent option if you’re after a full-protection case for the iPad 2. It’s handsome looking, works well as a stand in viewing and typing positions, lets you use the iPad 2 comfortably while in the case, and supports the iPad 2 automatic sleep/wake feature. It’s my new favorite iPad 2 ‘going out’ case. Tunefolio is a lot better although works similarly.